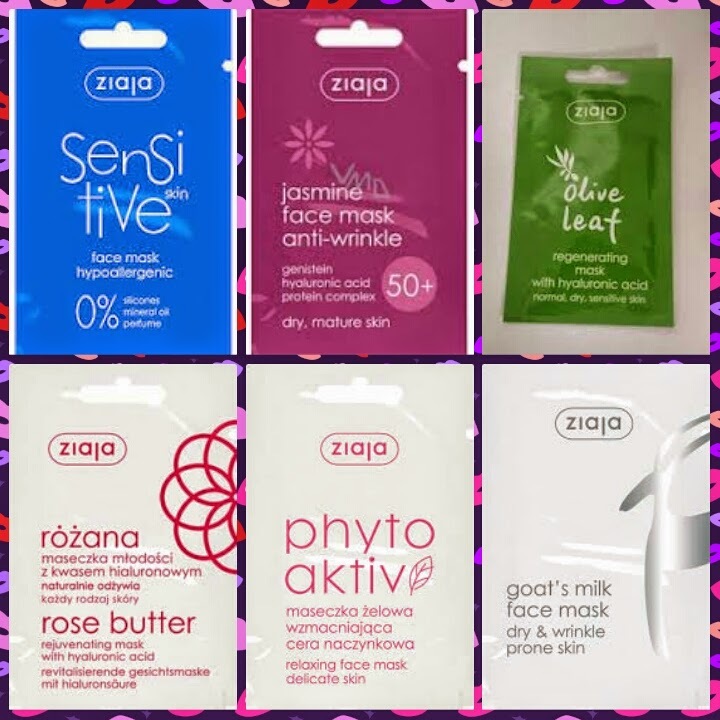 ZIAJA Ltd. is a Polish producer of pharmaceuticals and high-quality cosmetics based on natural ingredients for face, body and hair care. It is a family-owned company, established in 1989 in Gdansk by pharmacists Alexandra and Zenon Ziaja. Ziaja cosmetics combine highly regarded traditional components, such as herbal extracts and vitamins with modern technology. The formulas are based on pharmaceutical expertise. Ziaja's goal is to provide the most innovative, high-quality and advanced products at an competitive price for women, men, and children of all ages. Our products received many awards and honors. 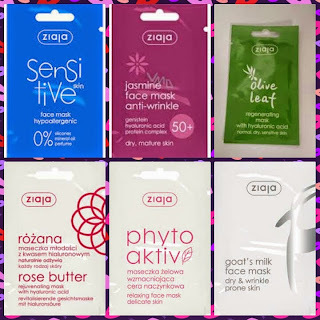 Ziaja Ltd. specializes in facial care products (creams, toners, cleansers), body preparations (balms and micro emulsions), hair conditioners and shampoos, feminine hygiene washes and toothpastes. 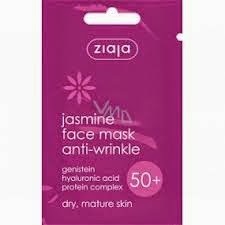 So for the past few weeks I have been road testing all of the Ziaja face masks. I have been going into Carroll's Ballybricken and purchasing two of the same masks every week for the past 6 weeks. I love a good face mask and none of these have dissapointed. They are all catered for individual types of skin. They all retail at around 70 cent each which is a great price. There nearly 30 cent cheaper than montagne jeunesse ones. Hypoallergenic face mask for sensitive, dry, irritated skin. Eliminates redness and burning sensation of the epidermis providing an immediate effect of soothing compress. Moisturises, smoothes and improves skin elasticity. Main ingredient in this is Antileukine 6 an extract from brown alga Laminaria Ochroleuca. It reduces skin inflammation caused by external factors such as air pollution, UV radiation. This mask has an anti-wrinkle and firming activity. 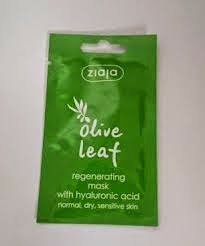 It also restore proper hydration of skin lasting for about 8 hours. This mask feels very lightweight on the skin, you would barely know it is there, but it does work very effectively. It rehydrates the skin and also make it feel firmer. You are recommended to use 1-2 times a week and for 1.40 a week for 2 masks it is definetly a very wise investment for anyone with dry sensitive skin. Exclusive face mask with concentrated anti-wrinkle activity. Effectively regenerates mature skin. Replenishes the deficit of nourishing substances. Softens and firms the skin. Main ingredient of this mask is Jasmine Butter which has a high nutritional value. So its nearly good enough to eat. The Jasmine Butter helps in the formation of ceramides responsible for skin stability and elasticity. This mask has anti-ageing and regeneration properties. It provides protection against photo ageing, protects against UV induced inflammation and keratosis, prevents inappropriate distribution of melanine and reduces the number of sun spots on the skin. It is aimed at wrinkle reduction, not only wrinkle protection. This mask is aimed at the 50+ range but I found it very effective in helping with wrinkles around my eyes. Again this is recommended 1-2 times weekly, and for 1.40 a week you can significantly reduce and protect against wrinkles. It is not just for the over 50's it can be used by anyone who wants to reduce or protect against wrinkles or has dry skin. Gently but effectively cleanses the skin. Moisturises and prevents dehydration. Prepares the skin for further cosmetic treatment. It is recommended for dry and normal skin. It has intensive nourishing and regenerating properties. The main ingredient is Olive oil obtained by cold pressing of seeds from Olea. Rich in vitamins and essential unsaturated fatty acids. It slowly absorbs into the skin, which prolongs the time of product application. Gently greases the skin and prevent an excessive water loss. It softens and gives elasticity to the epidermis. This creates a gentle film on skin protecting it against unfavourable influence from external factors. This mask also contains the beloved hyaluronic acid. This is recommended for those with dry/sensitive or normal skin. Apply 1-2 masks per week for best results. I found this mask to be very firming and my face felt very soft and supply following it. I liked the tightening effect the mask had while it dried. Creamy face mask recommended for every skin type 30+. Reduces deep wrinkles. Increases skin firmness and elasticity.Apply 1-2 times a week over face and neck. After 10-15 min massage the excess into the skin or wipe with a cotton pad soaked in warm water. So this one can be used as a mask and a moisturiser. This mask is recommended for 30+, dry and normal. 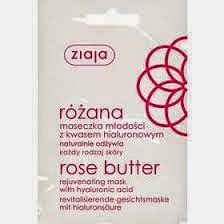 It uses rose butter not rose oil which is more commonly used among beauty products. It has anti-ageing and regenerating properties. The main ingredient is rose butter, which is very stable and contains valuable polyunsaturated fatty acids providing high nutritional value. It stimulates collages,elastin and hyaluronic acid production which are all responsible for skin firmness and elasticity. It prevents excessive keratinisation, dryness, dehydration, slacking and roughness in the skin. I found this mask very pleasant and anything that was left over on my face after 15 minutes i rubbed into my skin. It deeply moisturised my skin and left it very soft and supple. I recommend this one to everyone who suffers with any sort of dryness on the skin. As usual it is recommended to use it 1-2 times weekly. Strengthens the capillary walls and reduces their tendency to break. Revitalises the epidermis and smoothes minor wrinkles. Effectively soothes skin irritation. Apply mask 1-2 a week over clean face. Rinse off with lukewarm water after 15-20 minutes. This is recommended for women aged 17+. It is perfect for delicate skin prone to dilated or broken capilaries. Its main ingredient is Phytotal which is a set of horse chesnut, linden and cypress extracts. It reduces the risk of blood vessel rupture. It restores blood vessel elasticity and prevents the creation of spider veins. It soothes irritated skin and strengthens its protective barrier. I loved this mask. I have some broken capillaries on my cheeks and this mask reduced them coonsiderably. I defintely recommend this for young teenagers who are looking to strengthen their skin. Again apply 1-2 times weekly for best effects. Stimulates epidermis revitalisation. Visibly smoothes out minor wrinkles and delays skin ageing. Intensely nourishes and prevents dehydration. 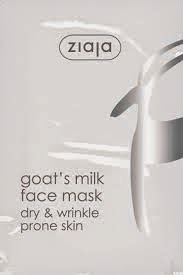 Apply the mask 1 or 2 times per week over face, neck and décolleté cleansed with Milk & Toner of Goat’s Milk Line. Rinse off with lukewarm water after 15-20 minutes. This mask is recommended for dry and wrinkle prone skin or for anyone over the age of 25+ . It has a rich creamy consistency with regenerative and protective properties. The main ingredient is goats milk proteins a set of indispensable nutritious macrocomponents. It contains milk proteins, vegetable lipids, and carbohydrates as well as vitamins A and D and calcium. It stimulates synthesis of structural elements of skin, improves its structure and smooths out wrinkles. It increases skin elasticity, protects the skin from harmful effects of free radicals and delays skin ageing. It nourishes and perfectly moisturises the skin. I love love love this mask it is so moisturising and my skin does be glowing after using it. Again use it 1-2 times weekly for best effects. So there it is ladies, all wrapped up in a nutshell. I loved all of these masks. They are so inexpensive and really help the skin. You definitely need to try some of these. Ziaja is available in waterford in Carrolls Ballybricken and elsewhere in http://ziaja.ie/contact/where-to-buy . 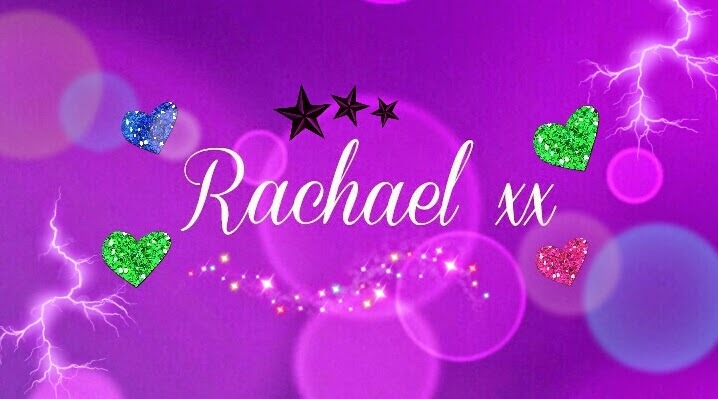 Make sure and check out this fab skincare range.